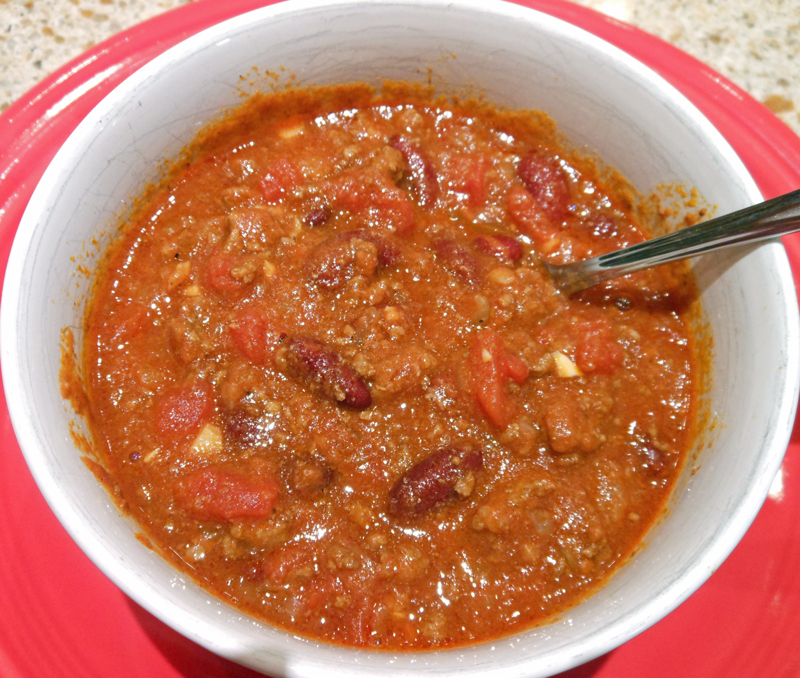 I have made so many different chili recipes but I believe this may be the best one yet. If you don’t like a lot of spice, leave out the cayenne pepper and/or the red pepper flakes. Adjust the spices to your liking. Now that the temperature is dropping to freezing, this is an excellent meal to make on those cold nights. Or better yet, serve this to your football fans. Top your bowl of chili with shredded cheese (I like Monterey Jack), sour cream, diced avocado, scallions or whatever you like. Next time I make this, I will be doubling it so I can freeze some for later. Heat oil in a large dutch oven over medium heat until shimmering but not smoking. Add onions, garlic, chili powder, cumin, red pepper flakes, and cayenne and cook, stirring occasionally, until the vegetables are softened and beginning to brown. Increase heat to medium-high and add the beef. Cook, breaking up the chunks with a wooden spoon, until no longer pink and just beginning to brown. Add the beans, tomatoes, tomato puree, and 1 teaspoon salt. Bring to a boil, then reduce the heat to low and simmer, covered, stirring occasionally, for 1 hour. Remove the cover and continue to simmer 1 hour longer, stirring occasionally (if the chili begins to stick to the bottom of the pot, stir in 1/2 cup water and continue to simmer), until the beef is tender and the chili is dark, rich, and slightly thickened. Stir in the last 1 teaspoon of salt. We made this chili last night for dinner along with Beer Bread and it was delicious. Thank you for another great recipe.